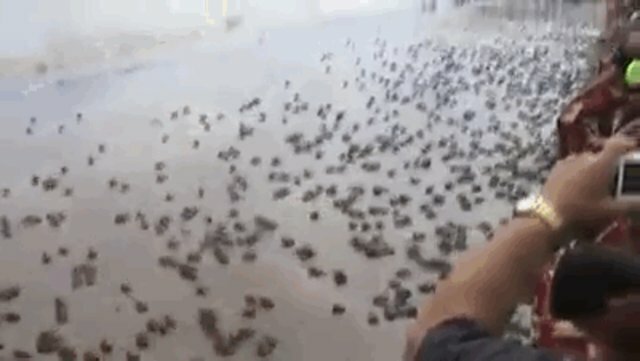 A massive group of tiny turtles was released into the water in Afuá Pará, Brazil, where they scrambled down the beach as onlookers cheered them on. The release was orchestrated by a group called "O Projeto Quelônios da Amazônia," or Brazil's Turtles of the Amazon Project, a campaign that aims to conserve the Amazon river turtle (Podocnemis expansa) and the tracajá (Podocnemis unifilis). Thus far, the group has participated in the release of over 300,000 pups to nearby rivers. See footage of the incredible release here. This isn't the only mass release of its kind - another turtle release in Brazil involved a whopping 180,000 tiny Arraus river turtles into the Amazon river. It's a good thing that there are lots of hatchlings to start off - turtles have little chance of surviving after birth, so hatching in large numbers are crucial to their survival. Females will return to land (sometimes the same beach where they hatched) to lay their eggs every two to four years. She lays a clutch of 50 to 200 eggs, then returns to the water, repeating a ritual that has been carried on for 110 million years. Predators like raccoons and sharks, commercial fishing, aquatic debris, habitat loss, climate change and pollution all contribute to a hostile environment for young sea turtles. An estimated one in 1,000 to 10,000 pups will survive these trials into adulthood. See this page for more information on the threats faced by turtles - and how to help.